Windows charms are the 5 helpers that appear on the right corner of the screen when you swipe down with a finger, or click down with the mouse. Actually, the Charms remind me of Vista’s Gadget Sidebar, but they are less intrusive, yet are always available at your fingertips. While you can bring up the charms from any Windows 8 screen, I suggest that you start at the New UI screen, or as in the screenshot below, the desktop. With a tablet computer the easiest way to see the Charms is to swipe downwards over the bottom right corner of your screen. Observe the finger movement in the screenshot. Once the charms appear, hover over the icons and the overlay will change to display their individual names. The trickiest way of launching the charms is with the mouse. If you are trying to acquire this knack my best advice is have faith, it will work! If no charms appear when you point the mouse at the right corner, the biggest problem is over-think. DON’T press either of the mouse buttons. Just hold the sides of the mouse and circle it gently over the bottom right CORNER. Windows Charms are full of surprises, and after a week of experimenting, I suddenly found you could awaken the charms by applying the same technique to the TOP right corner. Still frustrated with the mouse? Or if you prefer keyboard shortcuts, then press Windows Key +c. Incidentally, whichever method you use to launch the Charms, you also get a clock on the other side of the screen, fortunately this date / time display disappears when you dismiss the charms. At first I ignored the Windows 8 charms, then I thought they were a gimmick, but I soon became a convert. In particular, I like this consistent overlay for finding context sensitive Settings. Scanning the overlay from top to bottom, the 5 charms are: Search, Share, Start (Windows), Devices and Settings (those familiar cogs). For me, it’s that small wheel with cogs at the bottom of the overlay that’s the most useful Charm. When I am scratching my head and looking around the screen for an App’s settings, I have an ‘ah ha’ moment, and call for the charms! For example, until I dialled-up the Settings charm from inside my Weather app I could not change the temperature scale from Fahrenheit to Centigrade. The topmost charm, called Search, is very useful when you seem locked inside the App Store and wish to browse for more gismos. 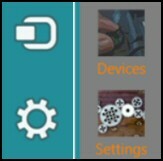 Even when you are not using a Windows 8 app, you can use this charm to find configuration screens. For example, the charms’ search seems more comprehensive than the traditional Explorer search supplied by the Control Panel. My friend ‘Mad’ Mick uses that third window charm to return to the main Apps start screen. I prefer to ignore the charms for this task and instead I just press WinKey. Incidentally, Mick thinks the charms sidebar has the same function as the old XP Start menu. In a nutshell, this charm is to give tablet users a consistent method of navigating back to the main screen. As for ‘Devices’, we really have to give this charm a chance by having a gismo or gadget actually plugged into our computer! For example, to stream a video to a T.V. you need to attach the monitor to your Windows 8 computer’s port. The Windows 8 Share charm reminds me of passing around a box of assorted chocolates, there is always one sweet that nobody chooses. There again, just as different people like different chocolates, those who love their social network will regard the ‘Share’ charm as a tasty tool. Another reason for using the Share charm is when you want files stored on SkyDrive to be available to friends. Note: You cannot share anything in Desktop mode, another clue this is sharing for Apps. Charms summary: Like the Control Panel, which some say they resemble, you cannot configure these settings. However, they are ubiquitous, consistent and grow on you. It is possible to change the graphics for the Charms representing Search, Share, Window, Devices and Settings. This programmer has also found a way to change the colour of the text. However, I have not found a way of adding more charms to the bar, or removing existing Windows charms such as the share. While I am happy with Microsoft’s charm originals, I admire the creator of Customize Windows 8 Charms. 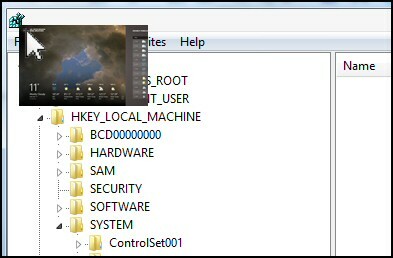 A similar technique to finding and mastering the Charms, is tracking down the Windows Desktop ‘Start’ and its menus. I suggest that you navigate to the desktop – pressing WinKey is a good way. This time, from the Windows desktop, focus on the left hand side of the screen; in particular the BOTTOM left corner. If you circle the mouse over the point of the corner, then you should see a mini Metro style ‘Start’. Tip: keep your fingers away from the mouse’s buttons. If you have a touch screen, then you can swipe down on the bottom left corner, see screenshot to the right. My favoured alternative is to press WinKey +x. 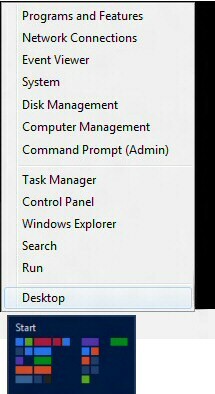 Amazingly, if you carefully right-click this icon then you get a whole menu of Windows 8 settings, which is reminiscent of the Windows 7 Start menu. See screenshot to the left. Push the mouse at the top right corner – key point. It’s really difficult the first time. Try different speeds, and try right in the corner, try 20 pixels in from the corner. Left-click in the thumbnail, you should be able to cycle through all your open Apps. Right-click and a ‘Close’ menu appears. 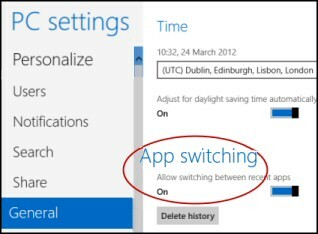 If the above App switching is not working, then navigate to the PC settings, General then on the right you should see a bar for App switching, make sure it’s set to ‘On’. The best way to make bring up PC settings is to press Winkey +i. The charms are available from virtually any Windows 8 screen, indeed they are designed to be both omnipresent, yet provide context sensitive settings for a particular App, Control Panel, or traditional program.